I love to eat sweet potatoes. 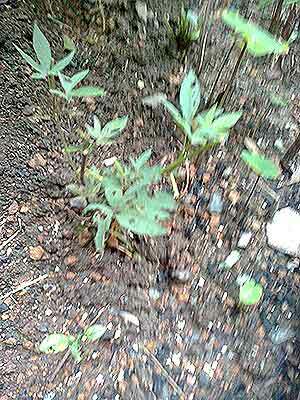 In fact, I have planted about 100 sweet potato vines in my backyard garden, hoping that big sweet potato root crops will grow after six months. Believe it or not, sweet potatoes can lower your high blood pressure, bad cholesterol, and even blood sugar. 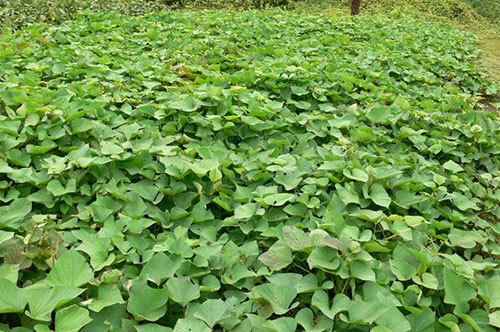 Growing sweet potatoes are quite simple compared to other crops. Simply cut the vine and plug it into the soil. It will grow with new leaves in just three days. 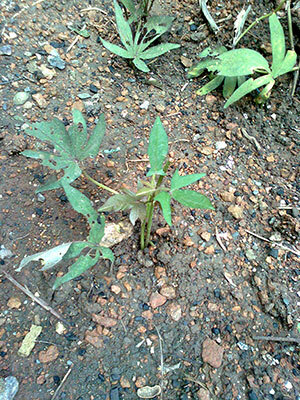 After few months, it will grow full of vines and leaves just like the photo below. Vines are easy to grow throughout the year. If you only gather the leaves, you can harvest it the whole year round for your breakfast salad every day. Oh yes, you can even plant sweet potatoes in a half-cut pet bottle and place it near your window. Ten bottles of it will supply enough salads on your morning table every day. In fact, I cut about 10 vines every day and cook it in a microwave for about 2 minutes. I spray it with sesame seeds and soy as seasonings for my morning salad. It could be the reason that I maintain normal blood pressure readings. It tastes good and it is healthy for everybody. Try it. You can practically have sweet potato leaves for free! The sweet potato sprout tastes very similar to spinach. Its nutritional value is also comparable to spinach. Spinach however, must have its seeds planted and you'll need to wait for over two months each time you harvest it. In the case of sweet potato vines, you can harvest it practically every 2 to 3 days per branch. I recommended this practice to all my brothers and friends three years ago, and most of them are now enjoying following my idea. All of them including their families claim that their blood test results are in normal range and their cholesterol levels have never been abnormal since then. They very much enjoy eating sweet potato sprout salad. In addition, I can tell you that sweet potato sprout salad can help relieve chest pain known as “angina pectoris”. Two of my friends reported to me about it. Your ideal sweet potato vine space is about 3 square feet for 10 to 12 vines, which is good enough for daily harvest for your morning salad. As I mentioned previously, planting sweet potato in a half-cut pet bottles (about 10 pieces) near your window can also provide you the same experience. Growing your own sweet potato plant is a truly a blessing, so why not try it, and enjoy good health! Did you know that a serving of sweet potatoes contains 327% of your daily need for vitamin A, which is more than any other vegetables!? Did you know that sweet potatoes are related to the morning glory family and NOT the family of potato? Did you know that when you are eating sweet potatoes, you are actually eating roots? Did you know that when you store sweet potatoes in your refrigerator, they will develop a bad taste as cold temperature will turn the starch to a sugar?